Alamogordo, New Mexico is a small, friendly, safe community nestled in a sunny, high desert basin which affords a warm, dry, comfortable year-round climate. Behind us rise the Sacramento Mountains, home of the Lincoln National Forest and the southernmost ski area in the country. Before us stretches the expanse of the Tularosa Basin and White Sands National Monument, the world's largest gypsum dune field. Our cost of living is low and national surveys have rated us as one of 50 healthiest places to live in the USA. One retirement publication rates us as the 16th best place in the country to retire, and another rates us at 19th. We hope that the information which follows will give you a sense of the vitality of this community. 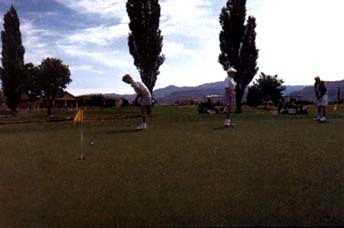 Alamogordo is an active place with abundant natural scenery and a wide range of outdoor activities including golf, tennis and skiing. We have something for everyone. You'll find the streets filled with folks who will have a friendly wave or a hello. Look us over. Alamogordo is a great place to raise a family, operate a business, or retire. We'd love to show you around. 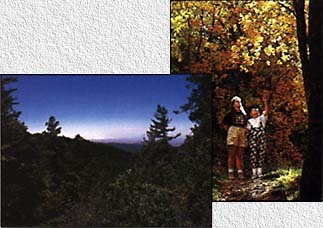 A community rapidly advancing from the past to the future and that is rich in history and natural wonders. Recently, Alamogordo built a City Hall, a Senior Citizen Center and a Family Recreation Center which boasts an Olympic size pool. In Spanish, Alamogordo means "fat cottonwood" and the average annual temperature is 75'. Transformed from a railroad, ranching and farming community, Alamogordo is a city that welcomes you. The International Space Hall of Fame, the Tombaugh Omnimax Space Theater and Planetarium, the Astronaut Memorial Garden, Air and Space Park and a Shuttle Camp are all features of the Space Center. The focus is "hands on" experience in the lunar rover or cruising the surface of the moon in the lunar rover or learning how an RL-10 rocket engine works. You can do all of this and more by stepping inside Space Station 2001. 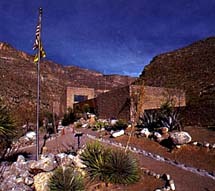 The Space Center is located 2 miles Northeast of Highway 54 in Alamogordo. 1 (800) 545-4021. Over 1200 feet of model railroad track and 2.2 miles of outdoor miniature railroad located at 1991 N. White Sands Blvd. (North end of Alameda Park). Hundreds of model and toy trains are on display in the five rooms of this 90 year old train depot as well as displays of engines, cars, cabooses and other nostalgic models. Visit the gift and model shop where railroad supplies are available. 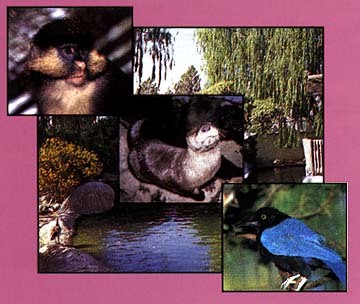 Established in 1898, Alameda Park Zoo is the oldest zoo in the Southwest. Visitors will walk through an assortment of native and exotic wildlife displays at this seven acre zoo. It is home to over 300 mammals and birds from around the world. Located on Highway 54/70 at the 10th Street intersection. One of the world's natural wonders is the glistening white sands of New Mexico, with nearly 300 square miles of great wavelike dunes of gypsum. Also see the animals and plants that have adapted to this environment. Stop by the Visitor Center that includes a museum, information desk, book store, gift shop. Families and singles have an enormous amount of year-round outdoor activities. 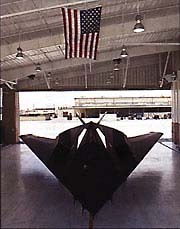 The area surrounding the Base is one of the reasons New Mexico was named "The Land of Enchantment". 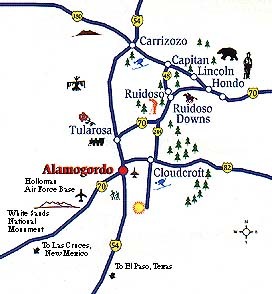 Holloman is located in New Mexico's Tularosa Basin between the Sacramento and San Andreas mountain ranges and is home to the 49th Fighter Wing. Located 10 miles south of Alamogordo via US 54, this state park has 50 campsites and is the site of an early American Apache Stronghold. The Oliver Lee Memorial State Park is named for Oliver Milton Lee, a pioneer and a New Mexico Rancher and a New Mexico State Legislator. Today's visitors enjoy the history of the park through fascinating exhibits in the visitor center, interpretive trails and the 19th century restored Lee Ranch House. 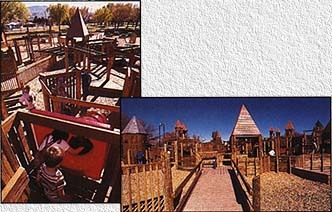 This is a unique and exciting playground for children and families. It is accessible to all children from toddlers to teens and for children with special needs such as the physically challenged and/or the visually impaired. Kids' Kingdom was built by the community to give children a creative, challenging, and imaginative playscape filled with fun that would not only exercise the body but the mind. Located at 2351 Hamiton Road, Desert Lakes Municipal Golf Course has a total tee distance ranging from 5,407 yards from the red tees to 6,491 yards from the blue tees. Receive private and group lessons and short and long term programs for beginners and advanced golfers are available. You will find scenic drives, outstanding hiking trails, striking seasonal colors and fresh mountain streams. There are many summer and winter activities to be had in this five-hundred thousand acre forest. Local | New! | Search | Links | News | HELP! PAGE DESIGN BY KEVIN HAY of SIMPLE COMPUTER SOLUTIONS. � 1996 TOTAL ACCESS, INC.